NS is new to the trail riding scene, having previously concentrated on freeride bikes and dirt jump hardtails. 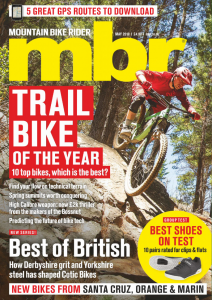 This is a hotly contested market though, with Whyte’s excellent 905 650b hardtail close to taking our Bike of the Year crown in 2014. So how does the NS stack up? It’s a little different from the crowd, using less common 4130 cro-mo pipes. With its hourglass head tube and slender profile it’s certainly easy on the eye, and given the inherently more forgiving ride of steel over aluminium, it should be easier on the lower back too. 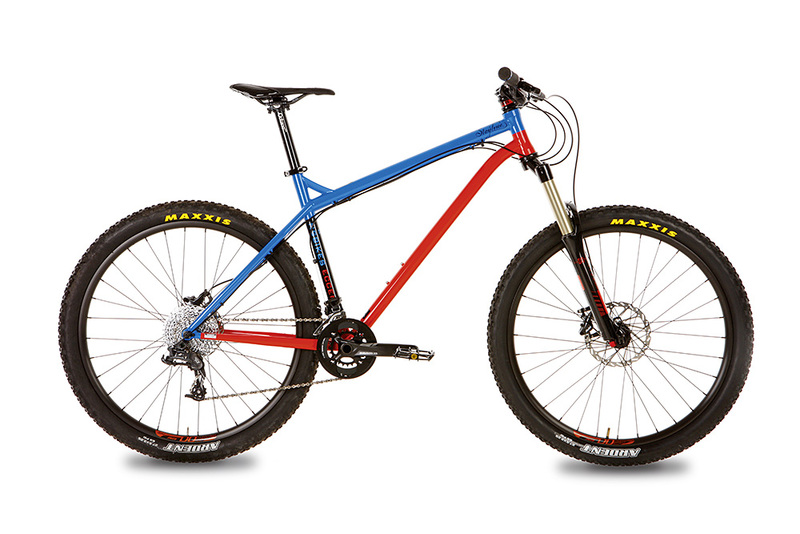 The Eccentric comes with a 140mm-travel X-Fusion fork and a stubby 45mm stem that looks like it’s straight off a BMX. Combined with the extra length in the frame, the cockpit layout is actually better than on the Bird, and you won’t need to worry about banging your knees on the stem or catching your shorts on the shifters. You do feel noticeably higher off the ground on the NS, however, and that’s because the BB is 4mm higher. That doesn’t sound like much but you can definitely notice it. Also, the handlebar is too high due to the conical headset-bearing top-cap. To get the handlebar lower, we flipped the bearing cover upside down and stuck it on top of the stem. It’s not an ideal fix, and a low-profile cover and some extra spacers would be a much neater solution. We also maxed out the seatpost extension on the 350mm post, so if you’re over 5ft 11in you’ll need a longer seatpost from the off. With 140mm of travel up front we were expecting a super-plush ride from the X-Fusion fork, but we never found a set-up that matched the Revelation on the Bird. Even when we noticed that we weren’t using all of the travel and dropped the spring pressure down by 5psi to match the recommendations printed on the back of the fork leg, grip didn’t really improve. Yes, it meant we achieved full travel, but the fork now felt overly active and divey when corning hard. Also, the 15mm quick-release lever doesn’t clear the fork lower leg, making it a pain to fit or remove the front wheel. While we love the low rolling resistance of the Maxxis Ardent on the rear, the round profile and shallow side-knobs don’t offer much in the way of cornering grip. So we swapped in the same Minion DHF 3C that’s on the Bird so we could concentrate on the performance of the fork, not the tyre. In terms of quality, the entry-level SRAM drivetrain is no match for the mighty XT. Still, we never dropped the chain once on the NS, which is more than can be said for the Bird. Also, even without any form of chainstay protection and no clutch rear mech, the Eccentric offers a whisper-silent ride. We weren’t so impressed by the super-long grips that make the bar feel narrower than it really is, however. Flipping the headset spacer improved our ability to get the power down when pedalling on flat trails, but the NS never generated any real sense of urgency. Still, the extra length in the wheelbase did at least make it feel more stable on the descents than the Bird, and there’s no denying the additional ride comfort provided by the steel frame. Unfortunately for NS, there’s also no ignoring the extra weight it adds. Steel does add comfort due to its forgiving ride qualities, but one of the joys of riding a hardtail is how direct it feels when you stand up to pedal. The result is that climbing is these bikes’ real forte, and to make the most of that, weight is the most critical factor, However — and for £400 less — the Canyon Nerve AL that won our entry-level suspension bike test in the July issue is 1kg lighter than the NS Eccentric, with vastly improved vibration damping and grip. Just a thought! The lacklustre performance of the X-Fusion Sweep fork compromised grip and control, while the overall weight of the bike put a real damper on our initial enthusiasm for the NS Eccentric. So, even though the 4130 steel frame is beautifully crafted, and there are aspects about the ride quality that definitely appeal, such as the chain staying on and the more comfortable ride, the Eccentric just isn’t err…eccentric enough. It really needs a better fork, a slacker head angle and a lower BB to play to its material’s inherent strength — which is bombing the descents.